Supreme is a high gloss floor finish designed to meet today’s demand for ultra durable floor finishes. Supreme’s unique formulation delivers a long lasting “wet looking” floor with fewer coats than traditional floor finishes. Supreme’s polymer system contains more cross linking than conventional floor finishes making it extremely scuff, scratch and black mark resistant. Expect floors finished with Supreme to last up to THREE TIMES longer than conventional finishes. High Speed buffing will restore Supreme to a wet look finish while its super durable formulation resists ground in dirt thus leaving you with a clear clean high gloss coating! Expect up to 1,500 to 3,000 square feet of coverage per gallon. Recommended for use in Hospitals, Nursing Homes, Schools, Day Care Centers, Grocery Stores, Retail Centers, Retail Malls, Warehouses and any other areas of non-resilient flooring. 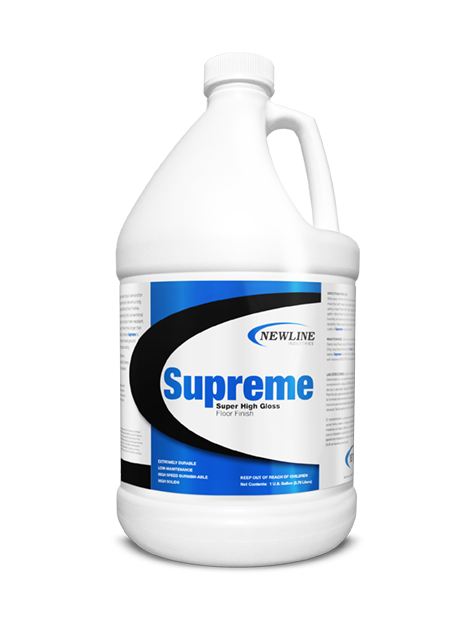 Prepare your floors with Express floor stripper or maintain them with Restorer and Neutral Clean by Newline. Available in Gallons, 5 Gallon Pail and Drums. New Shine is a High Gloss floor finish designed to meet today’s demand for durable high gloss floor finish. New Shine’s unique formulation delivers a long lasting glossy wet looking floor. New Shine is easy to apply and has an extremely resilient polymer making it difficult to scuff, scratch and almost black mark resistant. High speed buffing will restore New Shine to a wet look finish while its super durable finish formulation resists ground in dirt leaving you a cleaner and clearer surface. Recommended for Schools, Day Cares, Nursing homes and other areas where you have non-resilient flooring. 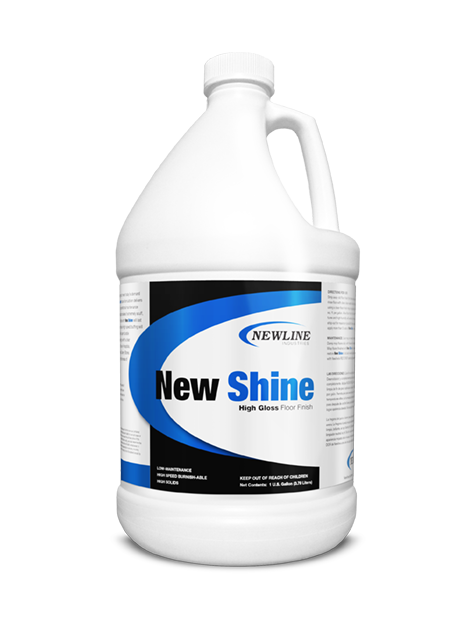 Maintain New Shine with Newline’s Restorer and Neutral Clean. Available in Gallons and 5 Gallon Pails. 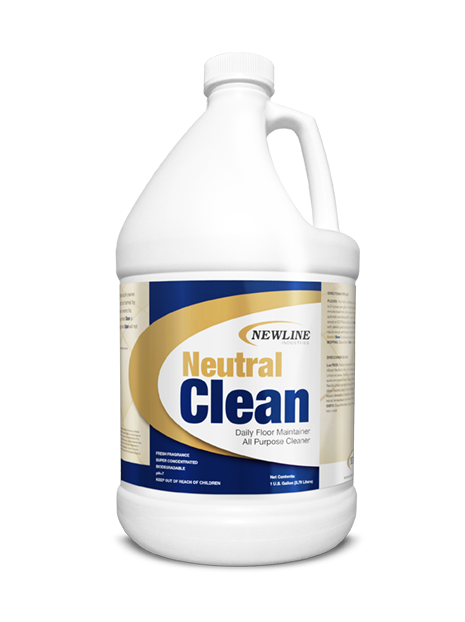 Neutral Clean is a highly concentrated neutral pH cleaner that will clean any surface not harmed by water. It is excellent for daily maintenance of ceramic tile, marble, wood, granite and vinyl floors. Neutral Clean is excellent for finished or wax floors and will not dull finished floors. Promote Neutral Clean to any customer who has grout sealer or natural stone sealer in their home. G-Strip is a low odor and high powered floor stripper that is extremely concentrated. G-Strip quickly liquefies multiple coats of frequently burnished floor finishes in one pass. G-Strip’s concentrated solvent and amine formula saves time and money without the need for harsh chemicals such as potassium or sodium hydroxide. G-Strip is more free rinsing than conventional floor strippers and requires no neutralization. G-Strip is effective when diluted with cold or warm water. G-Strip is certified as safer chemistry by Design For the Environment (DFE) a diversion of the EPA. 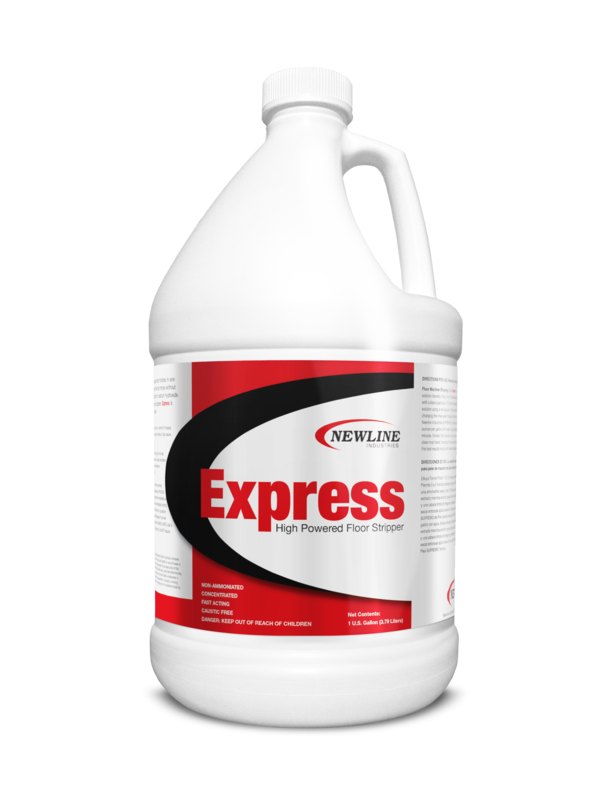 Express is a concentrated formula that saves time and money without using harsh chemicals. It is more free-rinsing than conventional strippers and stacks up against the best. Express is effective when diluted with cold or warm water. Express truly earns it’s name by its fast acting emulsification properties increasing efficiency, time and profits. Express is non-ammoniated, fast acting and caustic free. Restorer represents the most advanced technology in restorative floor chemistry. Restorer’s Wide Spectrum Chemistry is a Next Generation Cleaner and Restorer that provides unequalled results on all types of hard and resilient floor surfaces. Restorer was designed to use on all Newline floor finishes but can also be used on other brands also when burnishing to achieve that “wet glossy look”. Restorer cleans the surface film and prepares it for buffing and burnishing to a brilliant gloss and is used in many facilities for their maintenance programs. pHire (fire) is a high pH cleaner designed to attack the toughest soils on those impossible jobs. pHire is a great stripper booster and will effectively speed up your stripping process when you’re faced with old wax. pHire contains the latest in surfactant technology, chelating ingredients and alkali builders. Use this as your secret weapon.